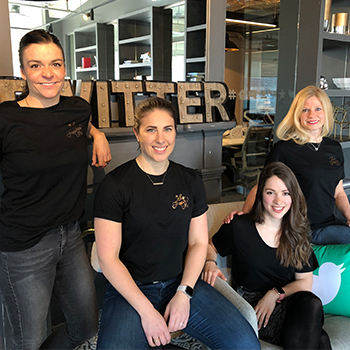 On International Women’s Day, I had the pleasure of visiting Twitter Canada to connect with an impressive group of Lazaridis School Alumni working at the social media giant. Although they were not on campus at the same times, the experiences and connections they felt to the Lazaridis School and Laurier community were apparent throughout the conversation. We talked about their path from Lazaridis School alumni to their current positions, why Laurier was the right place for their post-secondary education, and their advice for new grads or those looking to work in tech. Thank you to Twitter Canada for having us and to our interviewees for your kindness, openness and sharing – it was a fantastic morning! Title credit to Rachel Blake for making the witty connection.